At the bottom of China is a delta. On one side is Hong Kong, close to that is Shehzhen, further west again, skirting the delta and its spray of small flat islands, is Guangzhou. Each of these cities contains around eight million people, and there are yet two or three more of equal size. I'm not sure why just yet, but these cities, over the last few years, have seen the greatest economic growth in a country that has in itself seen the fastest economic development. Each city gleams with tall glass and metal buildings. It is at the edge of the tropical monsoon, and is therefore wet and warm. The islands and surrounding countryside contain ponds full of carp, and around each pond mulberry trees. Each one is a self-sufficient ecosystem - one component feeding the next in a satisfying cycle. I keep imagining these small quiet places amidst all this activity and wonder how it must be to live there. So much bustle and yet so much peace. And, probably, so much pressure to change. At the moment I am trying to work out a way of going there. I have worked out a way to get to Guangzhou, but now I want to try and find someone who will take me to the islands and the farms - preferably someone who can speak English and can do a little interpretation for me. This very interesting book was sent to me by One World Classics. It is translated from the French by Richard Howard. 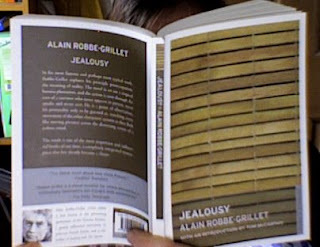 Alain Robbe-Grillet was born in 1922 and died last year. According to the note at the back of the book he was best known as the pioneering spokesman of the 'Noveau Roman' - a greatly influential movement in post-war French fiction. Vladimir Nabokov says that 'Jealousy' is the finest novel about love since Proust. It gives a cold impression, and yet because of what happens the reader feels the restraint of the narrator, and the heat that lurks beneath. I have the strong impression of something being held back as I observe 'A....' who I suspect to be the wife of the narrator, the plantation owner, sitting next to Franck, a neighbour who is married to Christiane (who herself rarely visits because of their child). I watch them as they sit - how closely their arms lie side by side, how their chairs touch - and I listen to them talk and learn how logical it is that A.... accepts a lift from Franck. Then, when Franck goes, I watch her leave the room, go up the corridor without speaking, close the door of her bedroom and bolt it, and then, through the window see her brushing her hair, one side and then the other - and the tilt of her head, the way it rebounds back as the brush finishes its sweep, and the way one eye keeps watching through the window. Because the narration is so objective the reader is never invited into A...'s head. Because I am a witness I can only guess, and so sometimes, with the narrator, I get things slightly wrong and have to revise my account. A smile turns out to be a shadow on her face, for instance, or A....'s walk to the dresser turns out to be to the pantry instead. I have found a very interesting obituary in the Guardian on Robbe-Grillet. He was initially a scientist, and maintained an interest in botany all of his life. He was also an innovative film-maker - and his films and his novels are equally influential. The novel, he says, should not be about characters or telling a story, but should be about 'imagination at work' and 'should create a mental world, not to be confused with the real world'. Once he found one of his books rigorously annotated by an American lecturer who taught his works, and claimed that the 'unfortunate American had got everything wrong'. It makes me slightly wary of saying anything much more about his work, but I think I shall. I have finished the book. It's very interesting and I've never read anything like it before. It reminded me of films I've sometimes seen in art exhibitions: a single scene looping around again and again, each cycle enabling me to something more - or something different. A.... brushes her hair, places the drinks on a tray, has the same conversation with Franck, arranges to go down to the port in his car. Each time it happens something more is added between the scenes already there. It is intense, and each time the scene is superimposed it is as if the pen digs deeper on the page or the light burns away, or the neurons in my brain fire with the same message again and again. Overall I'm not sure what has happened in this book, but I suppose Robbe-Grillet would say that doesn't matter. Instead of a conventional story I have the impression of something being created on the page and that, I think, is entirely the point. It made me think of further possibilities for my own work, and I'm really glad I've read it - by learning about Robbe-Grillet's creativity I have discovered a little of my own. Harold Goodman has taken over from the late Michel Thomas, having been taught his method. 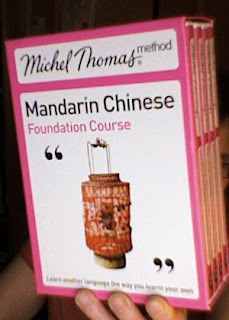 Today I did part of the first lesson from the Foundation course and was most impressed. There are four tones in Mandarin Chinese, and in this method each tone is associated with a hand movement: a green thumb which is something level like the chime of a bell; a blue finger pointing to the sky in which the voice rises as in a question; a red V of two fingers where a note falls and then rises again; and then finally a short sharp black note of one finger stabbing downwards at the ground. It was entertaining and fun. More tomorrow. 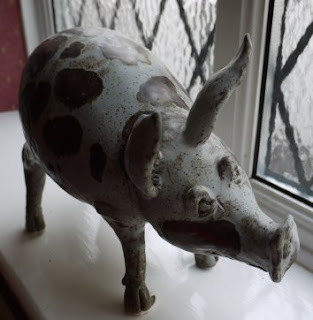 Oink - first picture with new camera. 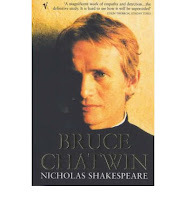 A small scrap of paper fell out when I opened it, and reading it I discovered that Bruce Chatwin ordered a hundred moleskins before he left on his travels to Australia - but they were not enough. Presumably he just wrote and wrote, and thinking about that made me remember what I love to do most - and that is travel and write... And it was as if some small flame burst into life inside me. I remembered travelling around Greenland and Patagonia writing down everything that happened in something similar - not quite a moleskin, but a bigger A4 version. 'Bomb Book and Compass' - and the flame grew higher. I think it was then that I realised that what I most want to do is to go to China and write, but at first I tried to ignore it. I let it burn for a while, but all the time it grew hotter until I rang Hodmandod Senior and told him what I wanted to do, and he said I should do it. So I made my first step. 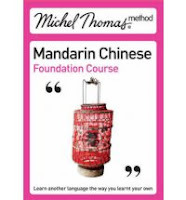 It is just a small one but I feel I am on my way: I ordered a Michel Thomas course in Mandarin Chinese and a DK travel guide. So thanks to the reminiscences of Bruce Chatwin, Paul Mason, Simon Winchester and Joseph Needham, I am going to go to China. 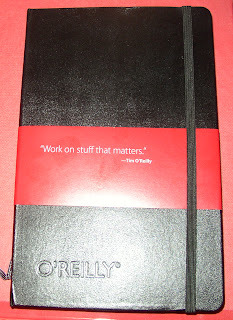 But it is the moleskin that started all this and especially the quote on the front: 'Work on stuff that matters'. So thank you very much Mark Thwaite (the man behind Book Depository): I am sure that you didn't intend this when you sent it, but I think you may have provided the kick I needed to stop moping around and actually do something. 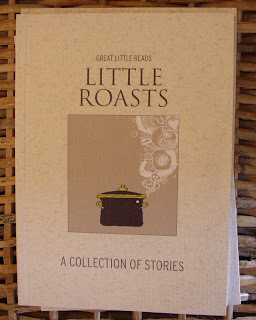 ...is in the great book review website Bookmunch just here. 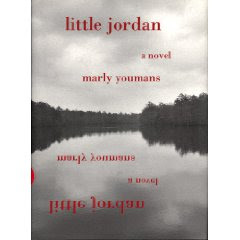 Marly Youman is a friend of mine. A few weeks ago I had the pleasure of reading her new book Val/Orsen, and she has kindly agreed to an interview about the book and her work. A short review and the interview follow below. Belle produces first a child called Orson who is mysteriously taken away by a passing stranger, and shortly after that delivers Val, his twin. Although it is Val who narrates the book, it is the shadow of Orson who dominates it. Her first-born arrives with a caul obscuring his face, and this little-known and little-seen child leaves behind a persistent and all-consuming longing. Marly Youman's work bridges its own fantastical space. It is a charmed forgotten world into which the modern day somehow seamlessly intrudes. The effect is startling. In Val/Orson, as in all her work, there is the atmosphere of a myth. It is not just the basis of the story - the separation of twins at birth - but the general ambience of the piece. Extraordinary things are accepted with a fairytale nonchalance: in this tale for instance there are tree-sitters. They are not introduced; why they are there and what they are doing has to be gleaned from the text, and this gives the whole setting depth and power. It manages to incorporate important messages about the environment as well as give a highly satisfying tale of loyalty and search for identity. For a novella there is an impressive range - from mesmerising accounts of fairy stories to gripping and realistic accounts of childbirth. The book is only available, so far, as a limited edition signed copy. It is a beautiful thing - well crafted inside and out - and I intend to treasure my copy. 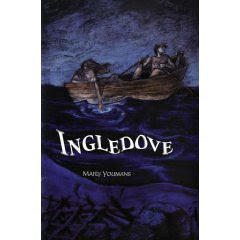 Marly is the author of seven books: a collection of poetry, Claire (Louisiana State University, 2003); two fantasies for young adults set in the Southern Appalachians, The Curse of the Raven Mocker (Farrar, Straus and Giroux, 2003) and Ingledove (FSG, 2005); and four novels, Little Jordan (David Godine, Publisher, 1995), Catherwood (FSG, 1996), The Wolf Pit (FSG, 2001), and Val/Orson (P. S. Publishing, 2009). 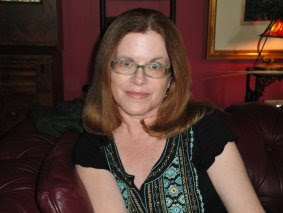 She has received various awards for her writing, including The Michael Shaara Award for 2001. A native of the Carolinas, she now lives a stone's skip from the often snowy banks of James Fenimore Cooper's Glimmerglass with her husband and three children. 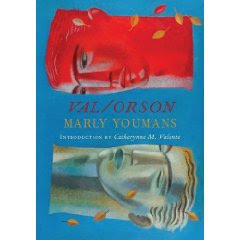 CD: When did you first learn about the myth of Val and Orson? What aspect of the story inspired you the most? MY: I can’t say, really; it seems like one of those things that was always present. As a child, I was fond of legends and fairy tales, so I suppose that I encountered the twins long ago. I’ve always been attracted by “wild child” tales, and Orson is very much a wild child with leaves in his hair and passion in his heart and no proper manners anywhere. 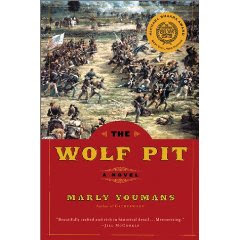 The Wolf Pit uses the figure of the wild child, and I suppose that Catherwood forces the wild on a child, and I can think of other figures in my writing who are wild and strange and at home in the wilderness. But I was definitely searching around for an idea that would put people into trees in a natural way. One of my first stories has a girl who meets her future husband in a tree; later on, they climb into trees to escape from a flood. So I suppose the image of people in trees is, for me, deep-rooted. CD: Are there really 'tree sitters' in California? If so, please tell me a little more about them. If not, please tell me where the idea sprang from. MY: Tree sitters are artists of civil disobedience, I suppose. Thoreau would have made a good one. They occupy old-growth trees, often on private lands, to protest the razing of ancient forests, to save individual trees, and to slow down clear-cutting while battles over land are fought in court. CD: Even though it is set in California you live nearly the other side of the country. What made you want to set your book in such a different place? MY: I wanted the big trees! More than that, I had in mind a book that would feel like a Shakespearean forest romance. My California is a place of the mind, as much as Shakespeare’s Illyria or the Forest of Arden. It is there and nowhere. Interestingly, Catherynne Valente (who wrote the introduction) found the story true of California. I liked that. CD: All of your work seems to evoke a spiritual involvement with the natural world. Where does this come from? MY: When he was a teenager, Jonathan Edwards wrote that the soul was made up of a series of fine threads—something like a harp, it seems to me. The better part of mine seems to be rather leafy and rain-dashed. 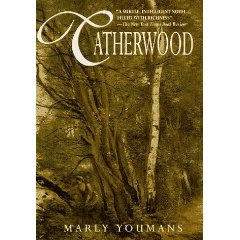 CD: Your work also seems to have a fantastical edge - it is subtle in Catherwood, less so in your children's stories - and there is still a hint of it here. Have you always been drawn to fantasy? What do you like about it the most? Have you a favourite author? MY: When I was in first grade in Louisiana, I received a slip-cased set of the Alice books. I read and reread those books for many years—and others, of course, but those above all. In Gramercy and Baton Rouge I found magical sights, although very different from the landscape of Alice. The combination of an excessive, strange, beautiful place and those excessive books worked on my mind and no doubt warped it a little, so that I have never found it difficult to believe in impossible things, or even to believe in six impossibles before breakfast. There is a fragment of the White Queen in me. My first favorite, then, was Carroll, but I did like a number of fantasy writers when I was growing up, particularly George MacDonald. But I was a passionate reader and willing to read anything that fell my way—my mother was a librarian, so a good many books did fall my way! I’ve read a lot of fantasy with my children, particularly Diana Wynne Jones—the Chrestomanci stories and Howl’s Moving Castle and more—and Leon Garfield and lots more. Right now I am reading all of the Potter books to my youngest—his current request for bedtime. And you ask “what do I like about it the most”: one of those good, simple questions that are hard to answer. Perhaps it’s a certain kind of joyfulness that comes from flying free of the usual boundaries, or perhaps it is something about the sense of childhood that lingers around fantasy—the condition of being a child is the condition of not fully grasping the rules of the world and of going forward on insufficient information, and fantasy returns us to that state. CD: You also write poetry - which do you like writing & reading the best - poetry or prose? MY: Nothing can compare with the feeling of going to the fount of things when writing a poem—the wonderful, up-flinging drops, the sense of an irresistible sluice of word. I also love to write fiction, though, so I must like what I am writing at the moment. As I get older, I find that I like reading poetry more than fiction. I’m always going back to Yeats, though I’m reading Michael Hamburger’s translation of Celan at the moment… No, I must be fibbing to myself because I’m rereading Dinesen’s Seven Gothic Tales and loving them as much as ever. Perhaps it’s what I’m reading at the moment that matters, just as it’s what I’m writing at the moment that I like best. I shall just have to take cover with Whitman and insist on contradicting myself and containing multitudes. 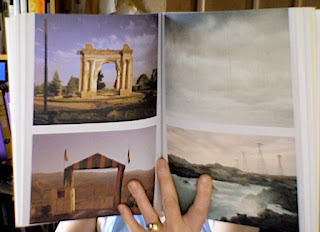 CD: I really like the structure of the book - particularly the way the chapters are very short. It works well. Is this something that was planned or just happened? MY: From the start I wanted short chapters, leaves on a tree, light and airy. MY: I squished a pearly one between my toes at Tanglewood one summer. And I recall a goose-bumped horror from my first residence in Yankeedom: I stumbled upon neighborhood children squatting around an immense tub of sand, a sort of bad castle covered with horrible stretched-out slugs, spotted leopardish things. I knew they existed already because the night we moved into our house, my mother stepped on one. We had to get a flashlight and examine the slime, unsure what madness had befallen us. Luckily we moved back South three years later. MY: My Southern ancestors squashed out most of my pride long ago—a hundred years back, at least. But probably it was holding each of my children for the first time. MY: Yes. Shan’t talk about them. I am a believer in reticence, a lovely old virtue that should be revived, especially around celebrities. However, I would say that nearly dying is a very good thing and helps one appreciate all the days after. The trick is managing the “nearly” part; go too far, and it’s no good at all. CD. What is the saddest thing you’ve ever heard of or seen? MY: I can’t answer this one; it’s like trying to point to a particular teardrop of water as Niagara slams over the rocks. There are just too many drops. MY: As a writer: I would shuck my inability to rejoice in marketing. As a human being: I’d like a more retentive memory. MY: If it’s winter in this outpost of the North, I check for snow. If it’s summer, I check to see if the morning hordes of tourists are bundled up or wearing reasonable clothes. And for snow. I always check for snow. Bic medium on Staples multi-use: 8.15am 17th June 2009.
out my arms like wings. At last, at last - when I returned from spinnin' today this was waiting for me - ordered from Amazon some time ago. It is by Geoff Manaugh, the creator of the magnificent BLDG BLOG, and it is full of stuff to delight a Hodmandod: underground places, visions of future buildings and settlements, even a section on continental drift. There are installations, art works and gorgeous photographs - all accompanied by Geoff's inspiring, fantastical ideas. It even smells of an art gallery - when I lift it up to my face and breath in I could imagine myself in the Hayward (I think maybe it is all that coloured ink, but whatever it is - I love it). 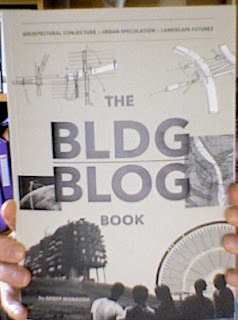 It's a bit like having BLDG BLOG in your hands and I am quite a little excited by it. I've been looking forward to seeing this for months and am not disappointed. 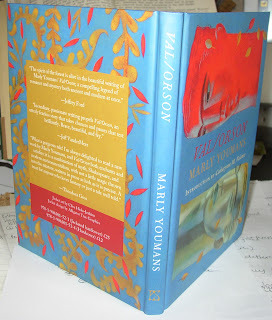 because they are gorgeous: textured covers, clear printing, thick paper and drawings of the authors on the back flaps. 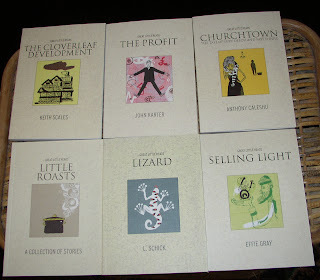 Obviously a great deal of loving care has gone into making these books and, as a result, they are little gems. It is a fusion of old world charm and today's lifestyle perhaps, a taste of a charmed, remembered time - and then we rush on. Since I only got half way through this book last weekend I am going to try and finish it today. It's a sultry day, too hot to do anything much, and I am a bit too frazzled to attempt to do any more of my editing job so I am going to sit back and relax with this book - which I am going to review properly for Bookmunch. Needham seems to have been eccentric in so many ways - for instance he preferred to eat his toast black because he thought the carbon was good for his digestive system. He thought it mopped up impurities. It's an interesting idea, not without merit- Needham, after all was an eminent scientist - but I think that most people these days would say this was not a good idea due to the carcinogenic chemicals also produced when toast burns. I am another couple more chapters through now and beginning to envy Needham. Because of his genius he seems always able to get his own way. 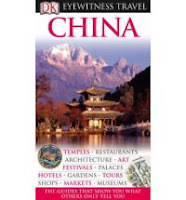 He manipulates his travels through China to fulfill his curiosity about the place; he establishes his mistress in China, as well as his wife, because he feels he can't live without either of them - and thus, very understandably, attracts the ire of a colleague; and then, after he returns to his suite of rooms at Cambridge, the college's requirement for him to do any teaching his waived so he is free to write his books. But then it is important that he writes his books; because he is the only one able to do so. His aim is to write about the science and civilisation and China. It is a book not aimed at the Sinologists or general public but to educated people who are interested in the history of civilisation as a whole. It will fill an important gap. The text that most stimulated the writing of the book was one that described the 1088AD technique to find south using a magnetised needle suspended on a piece of silk. This was a full century before a compass was described elsewhere in the world. Another chapter and in this I have learnt that, in addition to the compass, the Chinese invented the following: various sorts of complicated bridges, wrought iron, the wheebarrow, the fishing reel, the sternport rudder, the umbrella, the set of gimbals (used to keep things like compasses upright at sea), the spinning wheel, the kite, callipers, automated figurines, chain pump irrigation, stirrups, playing cards, fine porcelain, chess, tuned drums, and, maybe most important of all, in the sixth century, perfumed toilet paper that was both soft and strong. It has been in demand ever since. intersect, grow irrevocably bigger. And bigger. That cough you hear. That whisper. Pandemic. you draw in. That proclamation. Listen. Listen! down, its passengers too hot. And becoming hotter. in their swill. Like men. tick. But a sneeze, spraying into the air. Seeing to all of us. Following the shock news that my novel 98 Reasons For Being actually got a review on Amazon.co.uk I have just discovered that last month it also got its first review on the Barnes and Noble website too! 'Julie' apparently found it in the Bargain Books and liked it enough to give it a kind review. Thank you Julie - I'm very glad you dipped in that day. He goes on to consider what is happening in the high street now, and how this too is reflecting this same emptiness without character - it is a blandness he has seen before. At first this seems depressing and somewhat hopeless, but the essay doesn't end that way. There is, he says, a place for all these things - the new technology and the old - and our new challenge is finding the balance, and also working out what works best. It's a very interesting essay, and I recommend you take a look. Michael is hoping to initiate discussion on his thoughts. It is 4 am and already the sun has risen. Above the roofs of the houses a grey-blueness gradually yields to a pale yellow and then red. I look at the news and see that Nick Griffin of the British National Party has been elected to represent me in Europe. Then, when I look through the window again, it is as if the sky is bleeding. A few weeks ago, the British Library generously allowed me to borrow one of their expensive books for a fortnight from their document supply centre. It was one of the volumes of Joseph Needham's astonishing work 'Science and Civilisation in China', and it cost £120 a copy. 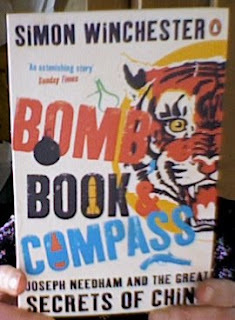 Today I am reading the story of Joseph Needham for a review in Bookmunch: Bomb, Book & Compass by Simon Winchester. It is turning out to be a surprisingly fascinating book. Although, on the face of it, Joseph Needham was a starchy, conventional, happily-married academic, he fell in love with a young woman from China - and this was to have a dramatic effect on the rest of his life. As last week, I think I might update this post throughout the day. 17.15. I'm finding the book very interesting, but my reading has been slow today. Apart from learning about the man, I am now learning about his travels through China, and hence about China during the second world war. It is before Communism and after the Imperialism. China is ruled by a Nationalist government and has been bombarded by the Japanese for several years. The Chinese academics have been forced to retreat into the Chinese hinterland, and Needham is enlisted by the British government to go there and provide succour. Ah, I am so glad I have my blogger friends. First Maxine wrote this wonderfully blazing post, then Crime Fic Reader added her astute comments, and now I've just read Gordon McCabe's fantastical answer. I am not exaggerating when I say that each lifted my soul in different ways. Thank you all three for your splendid writing. It gives me hope. I've just read Simon Singh's essay on why he has decided to appeal against the BCA ruling. "As a journalist, I have always been aware of the libel laws, but I don't think I ever fully appreciated the chilling effect they have on journalism - important articles are withdrawn and other stories are simply not commissioned because of the fear of libel." Please read the rest of this article. It is moving and profound (as well as a great piece of writing). Meeting on Privacy and Libel at the Society of Authors. Yesterday I went to Society of Authors Meeting on Privacy and Libel. The speakers were Nicola Solomon and Richard Barber. Nicola Solomon is one of the top solicitors in the country on libel and Richard Barbers has been an editor at magazines such as OK! 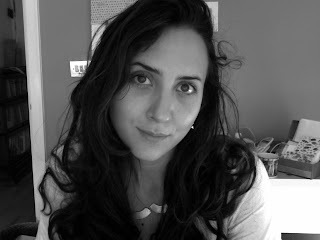 and is a freelance journalist and celebrity ghost writer. My notes come mainly from Nicola Solomon's part of the talk because although Richard Barber's talk was entertaining, and he gave us some interesting anecdotes, it was Nicola Solomon's which contained the most general information. I tried to get this down as accurately as I could - but any mistakes, of course, are mine - and I (grudgingly) take full responsibility for them. (iv) the Society of Authors are in the process of arranging a means for authors to find affordable cover and there will be details in the next edition of the Author. Nicola started by outlining the difference between libel and slander. I thought I knew this but I didn't - not precisely. Slander is spoken and the claimant has to show how they have been damaged. Libel is written, or performed on the stage and they have to show injury to reputation. There is a subtle difference, apparently. Together they are called defamation. The actual amount awarded has gone down recently but is usually in the range of £200 000. However, the costs can be even more enormous. (ii) And the claimant's reputation must be lowered; so a mass murderer may find it difficult to make a case! Similarly, it is probably not libellous these days to claim that someone in most fields of life does not believe in God because it would not damage their reputation; however it would damage the reputation of the Archbishop of Canterbury, and in a case like this would be libellous. Writers often think that if they do not name a person in a piece they will 'get away with it'. This is a common fallacy. In fact, if the claimant is identifiable, then the writer can be sued. Sometimes 'not naming' can make things worse - and can lead to all the people who could be the person not mentioned in a piece of writing suing the writer. For instance if the writer claimed that one of the sales people in a firm were being dishonest then all the sales people in that firm could sue the writer. Similarly, if the person is not clearly identified and can be mistaken for someone else then that 'someone else' can sue if it could have been them from what is written. This is pertinent to novelists. There are various methods to help try to preclude this sort of mistaken identity in a novel. It helps, when inventing a character to specify age, occupation and address and then check to see that person does not exist at that address through parish records or company files. I must admit I was pretty surprised to hear about this. Another alternative is to use a very common name such as John Smith, or to use a very strange or invented name. Lying about someone is not necessarily libellous if the lie does not damage the reputation. For instance claiming that someone could not attend because they were ill (when they were not) would not be libellous because everyone is ill sometimes and saying they are ill does not 'lower their reputation'. The precise meaning of the words as written is important. The test is to determine the sense any group of ordinary readers (even if they are in the minority) would make of a piece. If it is decided that just a few readers could take a piece to mean something defamatory then the claimant has a right to sue. These ordinary readers could have a sense of irony, and could also have specialist knowledge. For instance if a footballer were to be reported leaving a house which was the address of a brothel then the reporter could be sued, even if only few people had that 'specialist knowledge'. The piece as a whole is looked at - not just the headline. So a headline can seem to be defamatory on its own, but if the entire piece is not then that writer is quite safe. Repeating rumours is also defamatory. However, fair comment is not. So an opinion piece i.e. a review or piece of criticism is not libellous as long it is made clear that it just opinion. But it must be based on fact and not go 'too far' or exaggerate in a demeaning way. Death of either claimant or writer exonerates the writer. In the UK, the claimant can only claim within a year of publication. However, if a blog post or on the internet this is from last download so the writer can be potentially sued until the blog post is taken down. If a writer can claim that a piece is written on the basis that the public 'need to know' then this can be all right too. In this way investigative journalism is justified, and sources do not have to be named to protect them. Sometimes a 'damaged reputation' can be mended by an amendment or public, written apology. The laws in this area have tightened considerably recently. For instance in 2002 it was deemed okay in the courts for a newspaper to publish a story about a footballer visiting a prostitute; but in 2008 Max Mosely's affairs were considered to be breach of privacy (although the Times still has an article on line here). Naomi Campbell provided another test case. When she was photographed coming out of a clinic she won her case of breach of privacy because health is considered to be a private matter (as is family life, and contents of a home). In general it has to be shown that the article is of sufficient interest to the public (versus the claimant's human right to privacy). It has to be fact-based, non-intrusive and sympathetic. There has to be no breach of contract e.g. nanny who has previously been employed by a family is unlikely then to be allowed to write a book about her experience. In contrast to libel, the right to privacy extends to after the claimant's death...probably. This is still being tested. The UK encourages 'libel tourism' because the 'burden of proof' is with the writer rather than the claimant. Because the costs involved are large it is usually only the very wealthy that bring libel or privacy actions. They can afford expensive barristers who are experienced and convincing to the judge who decides the case (in contrast to the writer who usually cannot). Thus the law tends to favour the claimant. Judge Edie has often presided over these cases - as he was over Simon Singh's case. But today it has been announced that Simon has decided to appeal against this judgment - which could bode well for freedom of expression in this country. There is a petition to show your support on the Sense About Science site. Added Later: There is lots more interesting discussion on this topic on Nature Network. Maxine's post is a good starting point. I love drawing. 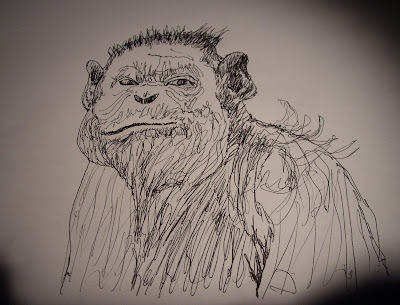 Several times in my life I have yearned to go to art school, and although I suppose I could have got in I doubt that I'd have had enough talent to be a professional artist. Nevertheless, I do love to draw. So I was interested to see a note from Colin Sherbourn who is the chairman of the Author's North committee I'm on (part of the Society of Authors) a couple of days ago. On Saturday, he says, it is World Drawing Day. The aim is to get one million people drawing online during the day. You can read more about it at Colin's blog (he is the cartoonist of the newspaper the Westmorland Gazette).